In a holiday destination like Jeju Island where an excellent highway network leads to its cities and attractions, self-driving is an easy decision. Step into the driver’s seat and discover the sights and sounds Jeju at your own pace. But before you start the engine, you must have an International Driving Permit (IDP) first. This is a mandatory requirement for foreign drivers in South Korea. Hence, car rental companies request for it. For tourists holding a Singapore driving license, application for IDP is under the Automobile Association of Singapore. Once the IDP is approved, it’s still advisable to carry along your standard driving license. Jeju Island offers plenty of peaceful drives. The beautiful landscapes along its coastal roads elicit unforgettable moments especially for lovers on a road trip. The Hamdeok-Woljeong Coastal Road stretches more than 20km of stunning ocean views. Take Hamdeok Beach as your starting point and breeze through nearby tourists spots that include Hamdeok Manjanggul, Maze Land, Gimnyeon Beach, and Woljeong Beach. A shorter but just as attractive route is Sinchang Coastal Road. Its path travels down the west shore, which presents interesting attractions along the way. Get an amazing view of Mount Songaksan, Geum Oreum, HyeopJae Beach, and Hallim Park. The subtle humming of vehicles is becoming a common thing in Jeju Island. Korea’s “special self-governing province” has been doing away with the loud petrol cars. Its goal is clear and straightforward: to become the global mecca for electric vehicles or EVs. To realise its goal, Jeju’s government has considered specific strategies and related tasks. These include the supply of electric vehicles, construction of charging infrastructure, and the popularization of related industries. At the end of February 2018, 36% of the total number of registered electric vehicles in Korea is from Jeju Island. This translates to 10,000 electric cars. As Jeju Island continues to progress toward its goal, its sole vision to claim a carbon-free island by 2030, perhaps even earlier. Over 10,000 electric vehicles are now registered in Jeju Island. In the coming years, the number is expected to rise as the self-governing province aims to become carbon-free by 2030. So what does this say to tourists keen on a self-drive tour of Jeju? It’s time to go electric! 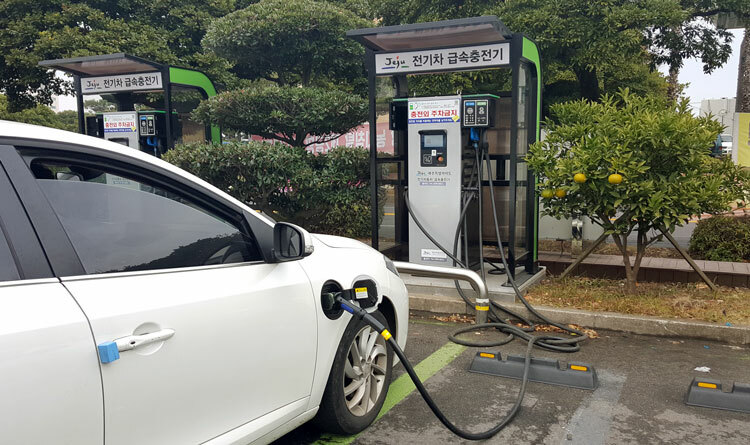 The boom of electric vehicles in Jeju is a result of its environmental efforts. Local manufacturers’ KIA, Renault Samsung, and Hyundai saw the opportunity from an emerging market. Foreign carmakers’ BMW, Nissan, GM and Tesla quickly followed. While choosing a brand that suits your style, consider one with English navigation. Google Maps may have translation problems in Korea, but Hyundai and KIA EV’s have built-in GPS in English. This is particularly useful when figuring out how to navigate to the nearest charging station. An electric vehicle works differently than any electric device. As a rule of thumb, recharge your EV before it falls below 30%. Otherwise, you’ll incur costs from the towing company. A standard EV has two ports: quick charge and slow charge. A quick charge takes 1 minute per 1% power. Meanwhile, a slow charge consumes 4 to 5 hours straight. Before plugging on the charging cable, switch off the car’s ignition. Then, choose the card as the charging method. Contact the charging card to the charger (card is provided by the car rental company). Finally, connect the charging cable to the car.